Published on 17 October 2012. 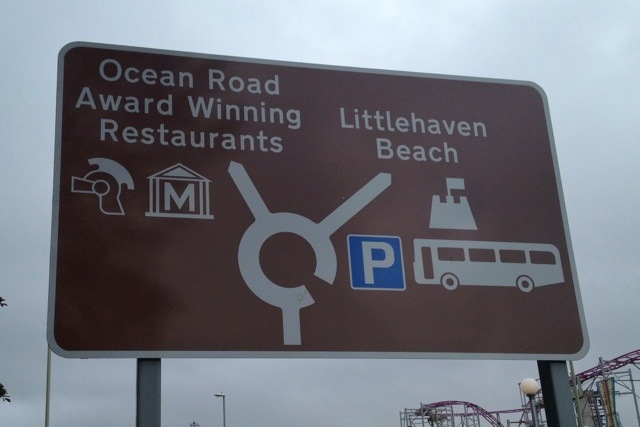 Putting “award winning restaurants” on a road sign seems like a great low-cost way for a local authority to provide free advertising, promoting local businesses and boosting the local economy. I wonder if it works in practice? And if so, I wonder if the benefits are great enough to outweigh the (probably small?) risk of diverting drivers’ attention from the road for a little longer, and making the sign (marginally) more difficult to interpret? This 1,853rd post was filed under: Photo-a-day 2012, Newcastle-upon-Tyne, South Shields.